If you like the convenience of pouched tuna but crave a dose of healthy carbs as well, look no further. 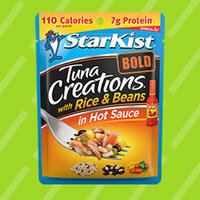 This brilliant offering contains premium tuna, whole grains, black beans, corn, and veggies, with spicy sauce. Wow! Whether you stick your fork right into the pouch or scoop it over salad greens, it's worthy of a spot in your grocery cart. Also new: Tuna Creations BOLD in Tapatío and Sriracha! This high-protein rotini pasta is a game changer. 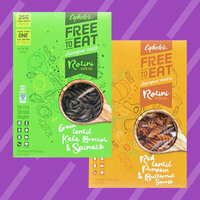 Made with ONLY lentils and veggies, it's gluten-free and free from the top eight allergens. Best of all, it tastes fantastic and has a terrific texture! The lineup features crazy-amazing combos like Superfood Orange (Red Lentil, Pumpkin & Butternut Squash) and Superfood Green (Green Lentil, Kale, Spinach & Broccoli). Track down a box, and try it in these Hungry Girl recipes! 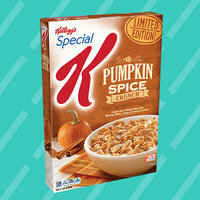 Listen up: This seasonal breakfast find may very well be the BEST pumpkin spice cereal out there! The flakes are ginormous, and we love the little spiced clusters of deliciousness. Stock up on these boxes of crunchy yum while they last... You're gonna miss pumpkin season when it's over! Today’s delicious finds are brought to you by Trop50 juice beverage. A Breakfast Staple with HALF the Calories + Lisa's Top Ate #SugarHacks! Reducing your sugar intake just got a whole lot easier... and more delicious! The great taste of orange juice is back on the table. Trop50 offers classic citrus flavor with NO artificial sweeteners and 50% less sugar and calories than traditional orange juice! Bonus: Each 8-oz. glass serves up 100% of your daily vitamin C and is a terrific source of potassium. That’s a sip in the right direction! OJ flavor four ways: Which will you choose? Are you a no-pulp person? Embrace the classic Trop50 No Pulp! Want that pulpy goodness? Trop50 Some Pulp is where it’s at. Looking for extra nutritional benefits? Go for the No Pulp Calcium + Vitamin D or Vitamin C + Zinc. Trop50 has got you covered! On this day in HG history, we launched our very first calorie-slashed pumpkin pie. These days, it's all about our World's Cutest Pumpkin Pies! Click “Send to a Friend” and share this info now -- what better way to start off the week?